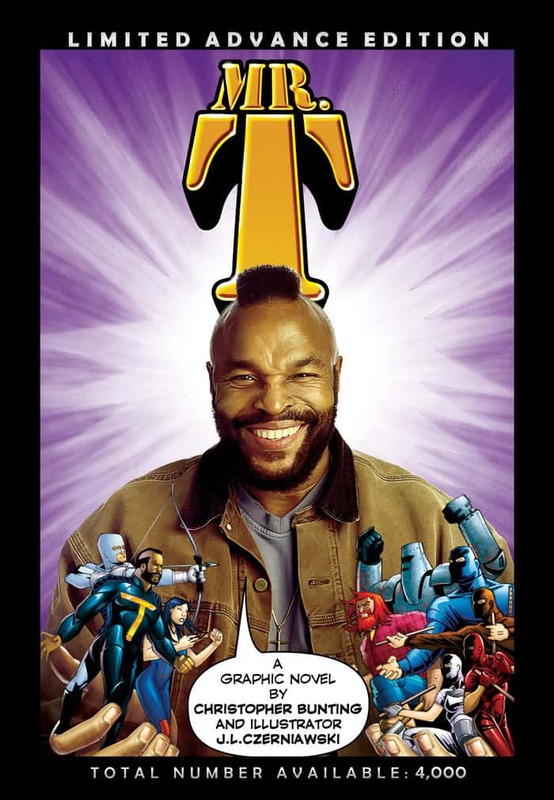 In anticipation of the major worldwide launch of their Mr. T graphic novel in summer 2008, British publisher Mohawk Media has announced that they are celebrating with a special Limited Advance Edition. With a total number of only 4,000 copies, Mr. T: Limited Advance Edition is now available. It marks the return to prominence of Mr. T, the Mohawk muscleman who was voted the fourth “Greatest American” in a recent global BBC poll, muscling in front of the likes of Thomas Jefferson, George Washington, Benjamin Franklin and Franklin D. Roosevelt. Bunting continues: ‘I’m often drawn to writing “mystery” dramas, where threads weave a much larger tapestry, with the core being the human journey, in the vein of “Lost” or “Heroes.” Therefore my attention had increasingly turned to novels and scriptwriting, and away from the shrinking comic industry. This graphic novel has been the perfect vehicle. I could approach it as a novel, yet also incorporate the finest elements from comics and television. Buckley continues: ‘Most so-called “graphic novels” are reprints of comics, the equivalent of cobbling together a bunch of episodes of a TV show and calling it a “movie”; or works that, in their desire to be highbrow, determinedly distance themselves from their comic forefather. Mr. T: Limited Advance Edition can be ordered direct from publisher Mohawk Media at www.mohawkmedia.co.uk for the exclusive price of Pounds 15.99 / $39.00 including delivery. Alternatively, from April 2008, it will be available through bookstores worldwide, including online, by quoting its 13-digit ISBN: 9780955680403.